Sloe gin for the win! 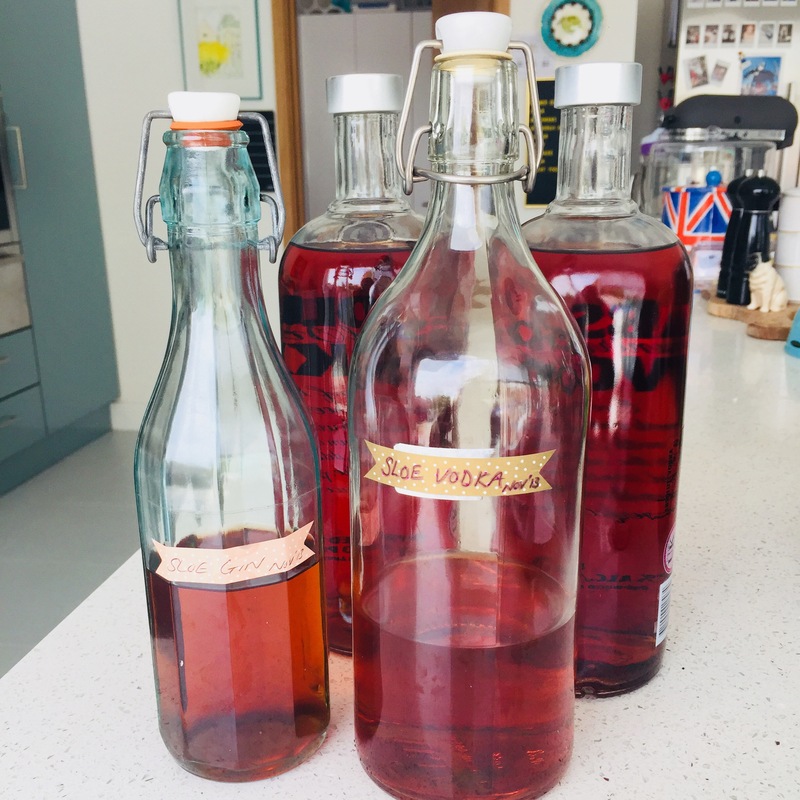 Sloe gin (or vodka, more on that later) is a lesson in patience, but if you put the time in each year to make a new batch (that will be ready for drinking the following year) you’ll have a never-ending cycle of sweet, warming goodness. And if it’s your first year and you can’t wait that long then it’ll be ready to drink in two months, it will just continue to get better the longer you leave it. So if you make it now you’ll have some ready for Christmas! I’ll be trying smaller batches this year, varying my gins to see what a difference a spicy gin makes compared to a fruity gin. I will report back in a year, mark it in your calendars! Generally speaking though you don’t want to use the cheapest gin you can find as you’ll need a lot of sugar to mask the harshness of it, nor do you want to spend a lot of money on the gin and find the complexities are lost amongst the fruit and sweetness. A good ‘recipe’ to start with is to stick to a 4:2:1 ratio of gin, sloes and sugar respectively. You can use less sugar (but I wouldn’t recommend none as a small amount will help draw out the juices from the sloes) then when the gin is ready mix with a sugar syrup to taste. I imagine you could also add a few spices (maybe star anise, or cinnamon) if you like a warming sloe gin, although this is the first year I’m doing this so it’s unchartered territory! You can also use vodka in the place of gin. This gives a cleaner flavour and is usually palatable sooner than when using gin. Just replace the same quantity of gin with vodka. My own results have been a bit hit and miss when using vodka. The first year we made it (alongside sloe gin of course, to properly compare and contrast!) it was amazing and hands down nicer than the gin. The second year we made a few bottles (to the same recipe) and, predictably, that year’s batch wasn’t as tasty. Rinse the sloes well and remove any leaves or stalks from the berries. Put the sloes in a large, clean jar (you don’t want to fill it more than a third full) and add the required amounts of sugar and gin then shake to combine. Store in a cupboard or dark room and shake the jar daily, the sugar should dissolve over the course of a few weeks. After two months you can strain out the sloes, using a muslin-lined funnel placed in a bottle. If you’re planning on leaving your gin longer before drinking you can leave the sloes in for 6 months to a year. Once you have bottled your sloe gin keep the bottle(s) in a dark cupboard. The flavour will continue to develop even after you have removed the sloes. My recipe ratios are based on those from the River Cottage Booze Handbook, in which a suggestion for what to do with your leftover sloes is made. Once drained put your sloes back in the jar, top up with cider and the next day you will have ginny, sloe-infused cider ready for drinking. Also, they call it Slider. Excellent.